Customers can save some money and see your company brand name everyday with our corporation branded piggy bank!! Lockable with a key operated base - you can ensure a secure small lockable coin storage for those needed breaktime snacks when the snack machine seems so much more appetising when hunger strikes back! Customise and personalise this wonderful corporation branded piggy bank so you can hand them out as freebies or company gifts to ensure future business. Customers will appreciate your generousity and it will not falter. 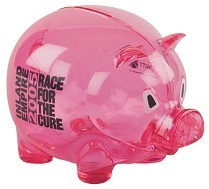 How about one of theses corporation branded piggy banks sat on your customers desk gaining retention everyday? !